Precious metals futures ended mixed on Friday but they all advanced on the week with gains ranging from 0.6% for silver to 1.7% for both platinum and palladium. Gold for June delivery dipped 70 cents, or less than 0.1%, to settle at $1,303.70 an ounce on the Comex division of the New York Mercantile Exchange. "It is normal for some profit-taking to ensue after a surge (in prices). Still, gold appears to be anchored in the $1,300-range, especially with the recent uptick in geopolitical tensions," Reuters quoted OCBC analyst Barnabas Gan. "The sustained uncertainty over (U.S.-North Korea) negotiations will likely add further upside to gold prices given safe-haven demand," Gan added. Gold futures traded 1% higher this week after dropping 2.2% last week. They scored their best close since May 14 on Thursday but on Wednesday they ended just 20 cents higher than their weakest close of the year. 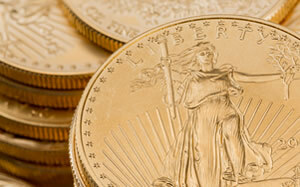 The precious metal is 0.4% lower on the year to date. "Eighteen market professionals took part in the survey. There were 11 votes, or 61%, calling for gold prices to rise. Another four voters, or 22%, were looking for gold prices to ease, while three voters, or 17%, see prices unchanged or sideways. Meanwhile, 730 voters responded in an online Main Street survey. A total of 393 respondents, or 54%, predicted that gold prices would be higher in a week. Another 243 voters, or 33%, said gold will fall, while 94, or 13%, see a sideways market." Silver for July delivery declined 14.1 cents, or 0.8%, to close at $16.546 an ounce. Its 0.6% weekly increase follows a 1.8% drop last week. Silver futures are 3.5% lower on the year. July platinum fell $11.30, or 1.2%, to $901.30 an ounce, but advanced 1.7% on the week. Palladium for June delivery rose $9.30, or 1%, to $976.80 an ounce, also logging a 1.7% weekly increase. The two metals cut into their year-to-date losses which now are at 4% for platinum and 7.9% for palladium. Gold gained $1.35, or 0.1%, to $1,303.50 an ounce. Silver rose 16 cents, or 1%, to $16.67 an ounce. Platinum declined $1, or 0.1%, to $908 an ounce. Palladium added $6, or 0.6%, to $978 an ounce. In weekly LBMA results, prices for palladium dipped 0.3% but those for gold, silver and platinum rose by 1.2%, 1.7% and 2.7%. Gold bullion coins advanced by 16,500 ounces this week after they climbed by 11,500 ounces last week. Splits included 10,000 ounces in American Gold Eagles against 6,000 ounces previously and 6,500 ounces in American Gold Buffalos against 5,500 ounces previously. American Silver Eagles rose by 230,000 coins this week after climbing by 100,000 coins last week. Sales of five-ounce silver bullion coins were muted for a fifth week in a row. Last week, 2018 American Platinum Eagles rose by 10,000 coins for their first gains in a week since the one ended Feb. 16. Their sales were muted this week.